ROTTING CHRIST Stream New Track "The Raven"
Greek metal trailblazers ROTTING CHRIST have unveiled a video for the new song "The Raven”. "The Raven" is the third track from their new album The Heretics out on February 15, 2019 via Season of Mist. Watch the lyric video below. "We proudly present to you "The Raven"; the third song from our upcoming new album The Heretics. It is the epilogue of the album, and one of our most atmospheric and melodic creations. It's a tribute to one of America's most (in)famous writers - Edgar Allan Poe - and more specifically to his influential poem of the same name. Enjoy "The Raven" and see you soon on our heretical path!" 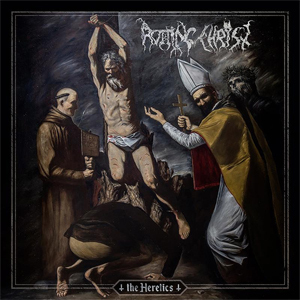 The Heretics was recorded by ROTTING CHRIST guitarist George Emmanuel at his studio Pentagram and mixed by Jens Borgen (AMON AMARTH, AT THE GATES, ARCH ENEMY). Pre-orders for The Heretics on limited deluxe CD Box, jewel case CD, limited LP and more are available now. Regarding the track, ROTTING CHRIST founder and front-man Sakis Tolis comments, "We're pleased to present to you the second track from our upcoming album The Heretics. The song "Heaven and Hell and Fire" is another chronicle of heresy and is influenced by John Milton's saying: "The mind is universe and can make a heaven of hell, a hell of heaven."" The artwork for The Heretics, illustrated by Greek artist Maximos Manolis, and track list can be seen below. ROTTING CHRIST were the first Greek band to break out from the underground and make their impact felt worldwide. The band return with their stunning new album The Heretics. In a signature style honed by 30 years of toil and triumph, the quartet deliver heavy metal thunder so epic that it could have been forged by the gods themselves. The anthemic "Heaven and Hell and Fire", "The Raven" and "Fire God and Fear" are staggering in their size and breadth. The power and majesty of The Heretics can only be achieved by a band with a lifetime's devotion to heavy metal, and proves these pioneers to be among the genre's all-time elite.